Update to this 2018 review as Vegan Flava, as promised, is now open at the Blue Dogwood Market (see below). The Durham location is no longer open. This past Sunday, my family visited Vegan Flava Cafe on Guess Road. Some of you may remember the former location of Vegan Flava Cafe on Chapel Hill Blvd, near intersection of Westgate Drive. The blessed Durhammites who enjoyed the Vegan entrees prepared by Vegan chef, Yah-i, while he worked at the Durham Coop on Thursday evenings know first hand how delicious Vegan cuisine can be when prepared by an inspired chef. 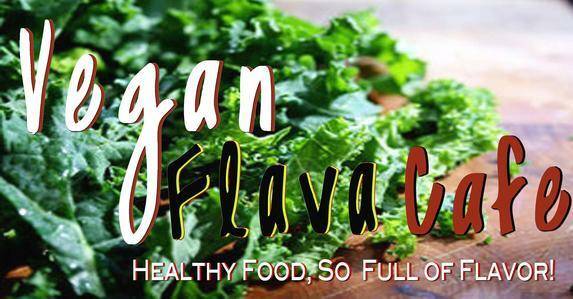 Currently Vegan Flava is open in Durham at the Shops at Northgate Mall (1720 Guess Rd Durham NC 27705) and planning a March 2018 opening for it’s long anticipated Chapel Hill location at the Blue Dogwood Market. The sign on the window is not up yet so don’t trust your GPS. Simply enter the plaza as if you were going to Randy’s Pizza or Sears and take an immediate left into the parking lot for the shops facing Guess Road. This Sunday I ordered the Sunday Brunch which includes- Pancakes, Fish Cakes & Grits, Black Beans, and Kale Salad. The pancakes come first with a side of real maple syrup. I have not eaten pancakes in several years so these cakes were a special treat. Next up an abundant plate of the beloved fish cakes, cheesy grits, black beans and Kale Salad. The fish cakes were introduced to me on Thursday evening $3 community dinners at Durham Coop. There are two ways to prepare Vegan and or vegetarian Meat/seafood analogs 1) come as close in taste and texture to the original meat or seafood product or 2) create an analog that stands on its own in taste and texture. The fish cakes were a Thursday night favorite at the Durham Coop for me because they met both aforementioned parameters. The cheesy grits were prepared with Daiya Vegan cheese which is known to melt very much like a dairy cheese and retain authentic taste and texture. These cheesy grits were authentically creamy and the perfect compliment to the savory black beans and Kale Salad. Sunday brunch is a healthy bounty and a great way to sample this chef team’s Vegan creations. 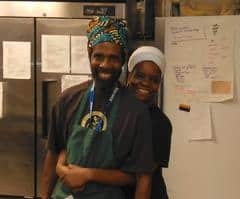 Husband & Wife team Yah-i & Maat created Vegan Flava Cafe in 2011 as a mobile catering business when they realized that the Durham area loved the unique flavor that the couple perfected in vegan food. This grew into a food truck and finally a brick & Mortar business in 2015 in Durham with the help of an investor. 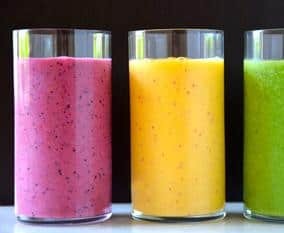 Vegan Flava is now a household word around the Durham/Chapel Hill area and beyond. Currently, Vegan is open in Durham at the Shops at Northgate Mall and planning a March 2018 opening for it’s long anticipated Chapel Hill location at the Blue Dogwood Market.